Your Ad Could Be Here! On Every Cellphone! Reach your customers where they are, on their phones! Our standard beacon broadcasts up to 4 messages at a time, up to 200 feet. Proximity marketing, marketing to people who are in or near your business is the newest way to reach people on their phones. Google has invested billions in this technology and all new Android phones are shipping with phones set to receive your "proximity offers". The way it works is simple. Our "beacons" transmit a signal, via bluetooth, to all the smart phones within the desired range. 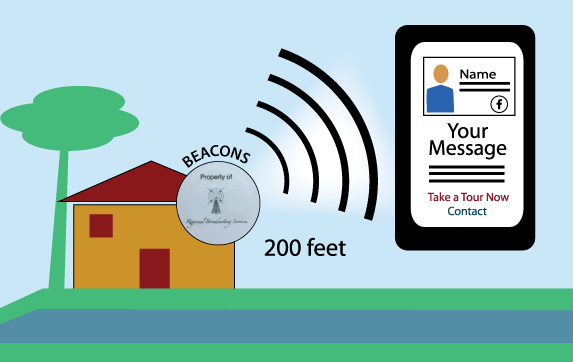 (Beacons can transmit 3 feet to 600 feet depending on the beacon and the need. To maintain battery life, we usually set our beacons to transmit 200-300 feet). This signal gets your message to everyone in your area and can take them to your website, a special offer on a landing page, your latest video, your Facebook page, show them your menu, or anything else you can do with a website. Currently 30-40% of all smartphones are set up to receive your message and that number is going up daily as Google invests more and more into this technology. Realtors - With a beacon inside every home you list, interested buyers can take a tour of the house, download your card and contact information or schedule a visit, all from their smartphone. Restaurants and Retail - People walking past your store can receive discount coupons, your menu, information on special sale items or your hours and contact info. You can even take them to your 5 star reviews or request that they leave a review. Service Industries - Plumbers, Contractors, Landscapers, basically any business with a fleet of cars or trucks can mount beacons in their vehicles. Now your vehicles are transmitting your message all day, reaching surrounding homeowners while you work and even when your guys stop for lunch, the truck is transmitting to everyone else in that parking lot. Beacons are small enough that you can take an extra one and keep it in your pocket, or your car and everywhere you go, you'll be promoting your business to anyone within a few hundred feet. We offer a variety of beacons: Our primary beacon allows you to broadcast up to 4 messages at a time approximately 200 feet. We also offer our High Power beacon which can only broadcast one message but can broadcast up to 750 feet and our WaterProof Beacon can be mounted outside. *Currently 35-40% of all phones are configured to receive "beacon" messages. That number will continue to rise. Broadcasts to phones via Bluetooth. Your message appears on their "Alerts" so it's sure to be seen. This technology is already being used by Fortune 500 companies and more businesses are discovering it daily. Don't be left behind and don't wait until AFTER your competition figures it out. We set it up and run it for you. All you do is decide where you want to put the beacons and the message you want to send. We do all the programming for you and because you lease the beacons from us, if one fails, return it to us and we replace it free. I Want to Get Started With Beacons, contact me!